Product categories of Water Discoloration Label, we are specialized manufacturers from China, Water Discoloration Label, Water Sensitive Discolor Labels suppliers/factory, wholesale high-quality products of The Water Color Discoloration Sticker R & D and manufacturing, we have the perfect after-sales service and technical support. Look forward to your cooperation! 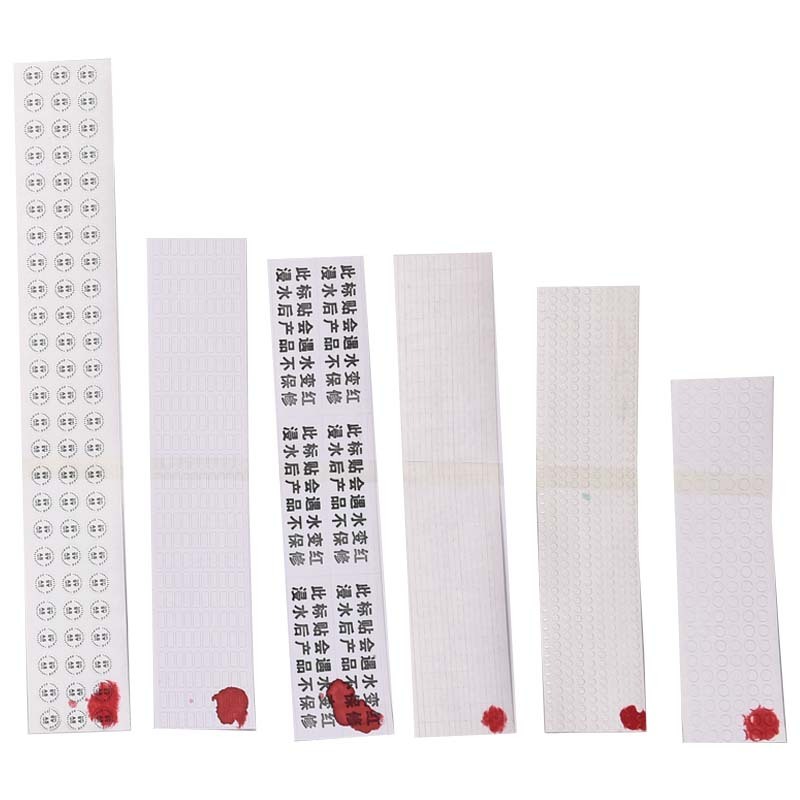 Water-resistant red anti-counterfeiting labels, also known as water-sensitive warning Anti-Counterfeiting Label or water-sensitive labels, waterproof labels, water discoloration labels. This label material will discolor when completely exposed to water, and the color is irreversible. It is a warranty that is difficult to identify or misidentify or control unqualified products after the current repair service has caused water damage to mobile phones, batteries, electronics, appliances, and LCD products. It is also a legal basis for identifying and providing claims for ocean freight shipments. A new type of product developed. The main function of the water security anti-counterfeit label is to show that when the substrate completely meets water, the surface will become a distinctly different color from the previous one, and it is irreversible, so the changed color may be any other color specified by the customer. The anti-counterfeit label that meets the water red can accurately test the abnormal results when entering the liquid. When an anomaly occurs, it can clearly determine the responsible party and protect the interests of both the business and the consumer. It has a strong sensitivity to humidity and can accurately show the extent of the damp surface. It is mainly used to test the identification of the product into the liquid and can play an aesthetic role. Defining the responsibility for damage to the circuit caused by liquids such as electronics, circuits, batteries, and mobile phones. 1. The main function of the water sense label is to show that when the substrate completely meets water, the surface will become a distinctly different color from the previous one, and it is irreversible. Therefore, the changed color may be any other color specified by the customer. 2, according to the critical moisture of the product after the water is damaged, you can choose to change the color according to the preset relative humidity or only completely discolored when fully immersed in water. 3, there are two main categories of waterproof labels, one is the proliferation of water: When the label is flooded, the original pattern on the label will quickly spread around. The other is water color: When the label is immersed in water, the color of the original label will quickly spread and become completely another preset color. Can be used for mobile phones, lithium batteries, mp3 and other electronic products in the water red anti-counterfeiting labels. Labels come in various sizes and shapes with water-to-water labels, water-discolored labels, security labels, and waterproof labels.